Combining exceptional performance with convenient portability, the tabletop Cuisinart All Foods gas grill (model CGG-200) makes a nice choice for any grilling enthusiast. The unit’s 12,000-BTU stainless-steel loop burner delivers the heat needed to cook up anything from salmon, red potatoes, and asparagus to steaks, slabs of fresh pineapple, and veggie shish-kabobs. 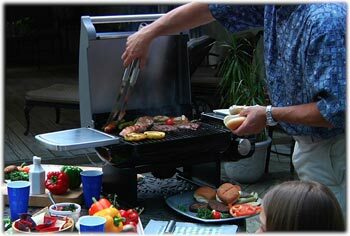 Its heat-distributing panel and porcelain enamel-coated cast-iron cooking grate help ensure excellent grilling results. Even more, the grill features a modular grill-surface system, which accommodates a variety of interchangeable panels designed specifically for frequently grilled foods like fresh summer vegetables, breads and pizzas, and delicate food items. An all-purpose veggie panel comes included (others sold separately). The grill’s compact size makes it well suited for small backyards or patios, while its folding stainless-steel side shelves and carrying handles allow for convenient transport to the beach, a friend’s house, or a tailgating party and back again. Other highlights include a precision temperature gauge, a stainless-steel lid, a twist-start ignition system, and a removable drip tray. The gas grill requires a propane tank for operation (not included) and measures approximately 19-4/5 by 27-4/5 by 12-4/5 inches. Durable 430 stainless steel grill lid with insulated double wall construction keeps the elements out, maintains even temperatures and reduces heat loss during grilling. Heat resistant 201 stainless steel lid handle makes it easy and safe to open and close grill lid to check, turn, and serve food. Dual stainless steel folding side tables (each measuring 10 by 10 inches) are strong enough to hold your largest, heaviest trays of food, grill tools, or accessories. Porcelain enamel-coated cast iron cooking grate offers a long-lasting grilling surface that provides strength, durability, and structure to the most heavily abused part of your grill. Heavy-duty porcelain enamel coated flame tamer provides a solid metal plate designed with enough thickness to withstand the high temperatures emitted by the burner and the juicy, fatty drippings from your food. Sturdy one-piece welded grill base constructed of porcelain enamel coated steel. 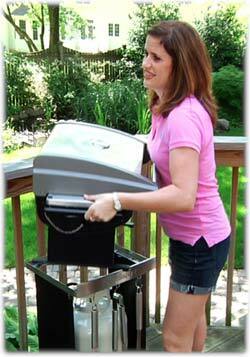 This base elevates the grill and holds everything together at an appropriate grilling height. Connects directly to the optional Cuisinart Folding Grill Stand without reassembly. An an impressive 240 square inches of grill space handles an abundance of food. Click here for a larger image. 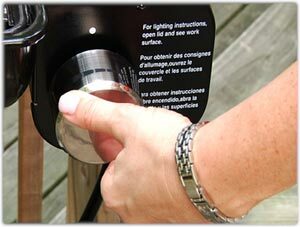 Begin with a simple TwiStart ignition system and in a matter of seconds the Cuisinart All Foods grill sparks to life. No need for two hands to get this grill lit–the one-handed lighting system gets your grill up and running without ever needing to put your beverage down. The durable stainless steel loop burner puts out 12,000 powerful BTUs and heats the grill grate quickly and evenly. The sleek, low profile design of the Cuisinart All Foods Gas Grill results in faster heat-up times when the grill is first lit, as well as faster re-heating when you open the lid to check or turn food. Within a few minutes after lighting, the grill heats up to ideal grilling temperatures. While 500 degrees F may be unchartered waters for most portable gas grills, it is quite the norm for the powerful Cuisinart All Foods Gas Grill. One-handed starter. Click here for a larger image. 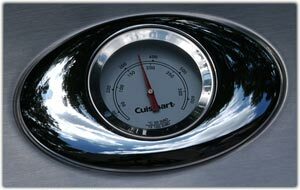 Temperature accuracy is essential to grill different foods properly and offer your guests the correct desired doneness of meats, fish and poultry, which is where the integrated precision temperature gauge comes in. It clearly displays the internal temperature of the grill and allows you to accurately and confidently manage desired grilling temperatures for the variety of foods. Designed for versatility and exceptional contact grilling, the porcelain enamel coated cast iron grill grate is designed for versatility and exceptional contact grilling. With a large 240-square-inch surface, it provides ample grilling space for an abundance of food–adequate for up to 8 people. Either side of this uniquely designed grate can be used depending on the food you are grilling. The flat side provides maximum contact surfaces and exceptional grill lines for steaks, chops, and poultry, while the opposite side offers better surface point grilling for more delicate foods like fish and seafood. Either way, the cast iron grate distributes heat evenly and efficiently so you can grill your food in a uniform manner with no hot or cold spots. The All Foods grill combines the ideal size of an everyday backyard grill with the versatility and compact ability of a portable grill. And unlike large, multi-burner full-size grills, the Cuisinart All Foods grill does not take up a large portion of your deck or patio, and does not waste space on extra grilling areas and burners that waste propane and rarely get used. When docked in the optional Cuisinart Folding Grill Stand, the grill becomes an efficient, economical everyday grill that will handle all your grilling needs. It’s designed to take 14.1- and 16.4-ounce bottled liquid propane (LP) gas canisters, but by adding the optional Cuisinart 4-foot LP Adaptor Hose and purchasing a 20-pound LP tank, you can grill longer and more efficiently without needing to constantly change fuel canisters. Despite its ample grilling space, the All Foods grill is easy to take on the road thanks to its compact size and 35-pound weight–making it ideal for beach parties, tailgating, camping, and more. Designed for portability, features folding hide-away side shelves and 2 integrated handles for convenient carrying, loading, and unloading. And the optional Cuisinart Folding Grill Stand is equally portable–folding down to about 2.5 inches thick–so your entire grill set-up can easily go anywhere you go. The Cuisinart All Foods comes disassembled into the following parts: lid and firebox; grill leg assembly; cooking grate; drip tray; screws and washers. Be the first to review “Cuisinart CGG-200 All-Foods 12,000-BTU Portable Outdoor Tabletop Propane Gas Grill” Click here to cancel reply.